Home » Blog » Ad Grants Account Suspended? 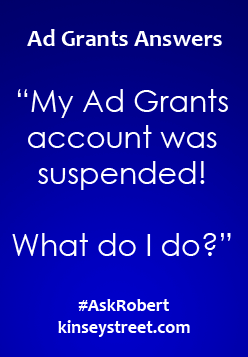 Here is why your Ad Grants account was suspended and (more importantly) what to do now. UPDATE: If your account was suspended on September 9th, 2017 read the updated article on 9/9 Ad Grants suspensions for what to do. If your Google Ad Grants account was recently suspended then your account may have been one of the many that was recently deactivated because it was not in compliance with the Active Account Management policy. This policy requires that you log in to your Ad Grants account at least once every 30 days and have changes made to the account at least once every 90 days. Many grantees have reported receiving emails from Google stating that the account was cancelled and that a budget was due. If you received a “balance due” email, you may ignore it as that is a system auto email that should not have gone out to grantees. To reinstate your Ad Grants account, you will need to log in and follow the prompts to contact AdWords support and they will likely reactive the account if this is the first time for your account to be deactivated due to an Active Account Management policy violation. Once the account is reinstated, it is IMPORTANT that you abide by the Active Account Management policy or your account is subject to being cancelled permanently. NOTE: If you do not have the internal bandwidth to provide active account management you may hire a third-party agency to manage the account for you and keep you in compliance with Ad Grant policies. Kinsey Street, does provide low cost Ad Grants management services to nonprofits and many nonprofits find that they achieve greater success with Ad Grants with professional management.